Ok so now that you got all your ideas in front of you in your notepad, just go through them and look at which topics that you can post on easily, (This is important so pay attention) the ideas on which you can post easily?? Just cut them off… Yeh you read correctly … cut them off … that’s cause the easy one’s are always the one’s that many others have written on also. The one’s that you may find difficult on your list are the one’s you should concentrate on. Select one topic from the hard one’s that you think you can blog on ( now don’t start a blog just yet okay !!! ). Now comes the post :) this is totally upto you cause I can’t tell you what to post and what not to post :) just make sure that you mention the topic of your blog in all your posts and be original … don’t copy and paste stuff from somewhere else ok !!! The use of the WLAN (Wireless Local Area Network) function on the Nokia E61 allow speeds of up to one (1Mb) Megabit per second as you can connect via your broadband router. 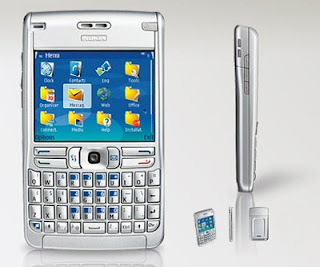 The main issue is that you set need to setup security on you Nokia E61. Both types of security WEP and WPA are supported. You will need to set the encryption key manually on your broadband router, which may mean changing the encryption on PC's that are automatically set up like the broadband router supplied in Windows XP. Click the left button displaying "Options"
Move button pointer right and Select "Use default settings"
This code is kept very simple and should be a mixture of numbers hexadecimal . This must match the encryption type and the WEP key on the router. The security connection will be (WEP) Wireless Encryption Protocol with the simple key of "0101010101", (10 characters) using 64bit Hexadecimal. This is a very simple key and not recommended for serious strength (because its used in this example). Whatever the key you MUST keep it safe or people will be able to break into your network. Click "Connection Name". Set the name "WepNokiaE61". Press left button "Ok". Select "Wireless LAN" from the list,  Press left button "Ok". Move down to "WLAN netw. name" , Click the button. Select the "Search for netw"  Press left button "Ok". The pop up says "Searching for WLAN networks"
The pop up now says "Select the WLAN netw"
If you cannot see any networks move nearer to the Wireless LAN router. Leave the "Network status" as "Public"
Move down to "WLAN netw. mode" , Click the button to select "Infrastructure". Move down to "WLAN security mode" , Click the button. Select "WEP" from the list,  Press left button "Ok". Move down to "WLAN security settings" , Click the button. Select "WEP key in use" from the list, and Click the button. Select the "#1", Press left button "Ok". Leave the "Authentication type" to "Open"
Move down to "WEP key settings" , Click the button. Select "WEP encryption", Select 64 bits  Press left button "Ok". Move down to "WEP key format" , Click the button. Select "Hexadecimal" from the list,  Press left button "Ok". Move down to "WEP key" , Click the button. Click the left button and select exit to get back to Menu and go back to and to test the connection. To find all near local WLAN. Move to "Connect" icon. Click button. Select "Conn. Mgr" Click button. Select "Availab. WLAN", Click button. This displays all available WLAN networks. Select a network. Click "Options". Select "Details". Click "Select". The strength of signal is now displayed. Moving the joystick right will scroll the various WLAN devices.